SimonWillis.net: Where To Carry All That Stuff On A Triathlon Bike? That's a serious question - where do you carry it all? 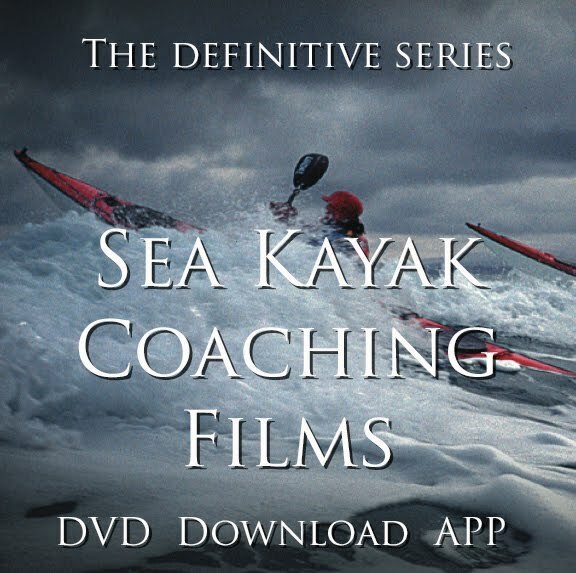 Especially for middle and long course events in the UK and other parts of northern Europe. 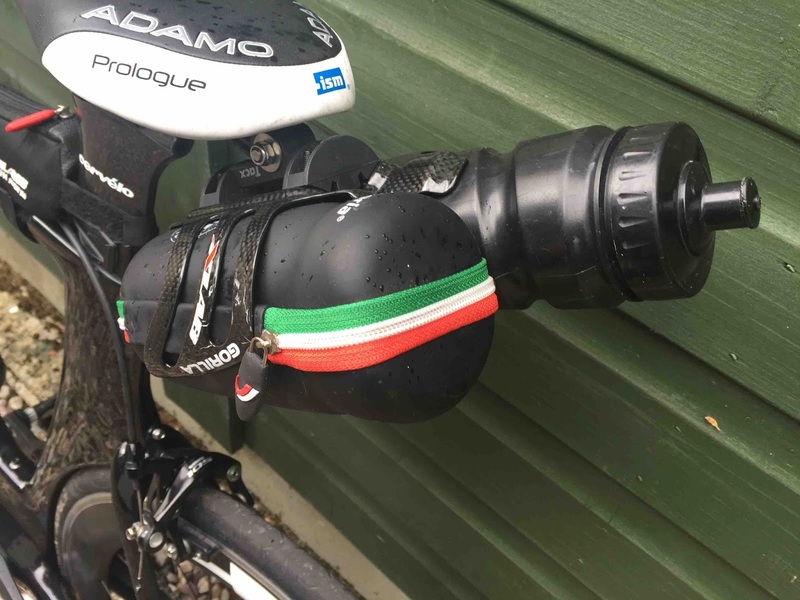 The weather can be less than perfect and try jamming a rain jacket into a tiny Tri-suit pocket! If you have any suggestions / thoughts / ideas please let me know in the comments. 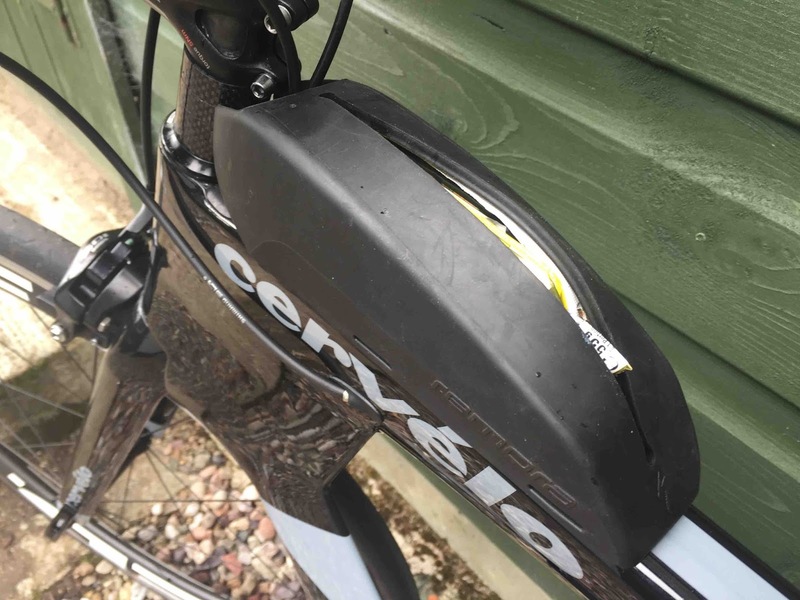 This is my Cervelo P2 rigged for training rides of 4-5 hours in duration around the Scottish Highlands. Actually, it has never been used for racing. 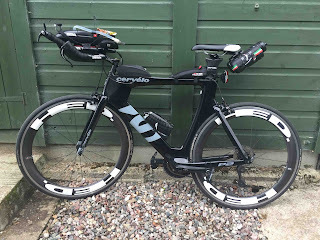 Staffordhire IM70.3 will (probably) be its first race. with four gels tucked into the zippered X-Lab Stealth Pocket 100 in front of the seat post. It works fine, but the X-lab one doesn't sit as flat as I'd like because the rear brake cable comes out of the frame underneath. It'll sit better during a race because I won't need the rear light. 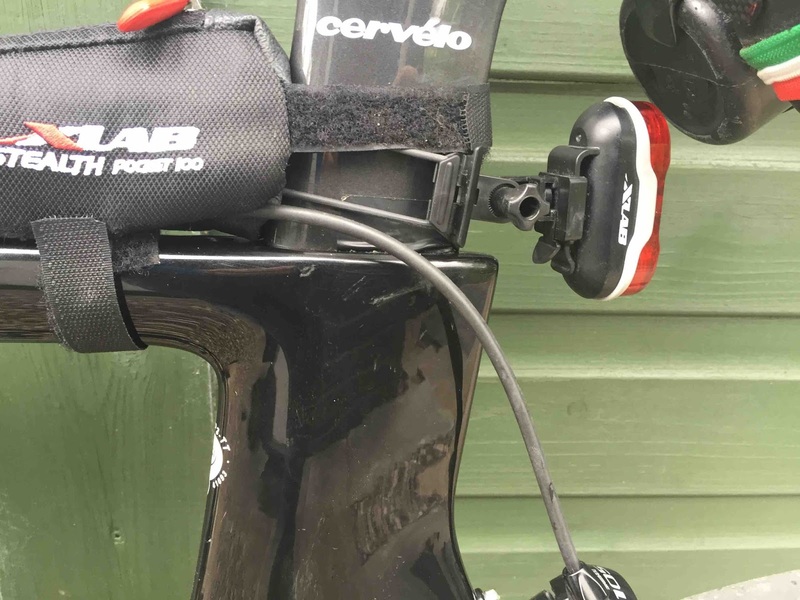 Spares and tools are in the Vittoria bottle cage tool bag behind the saddle. I carry two inner tubes, three co2 cartridges, two tyre levers and a multi-tool so hopefully I'm never stranded miles from anywhere. Double punctures do happen. This is heavy so I'd carry less racing. Alongside the tool-carrier is a spare 75ml drinks bottle. There's another 75ml of liquid in the Profile Design FC35 'tank' between the bars, with the 'treat' PowerBar and space for wrappers before I find a bin. 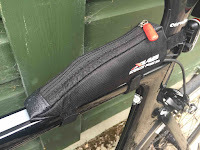 I've not used this in racing, but I've ridden with it for a while now and I like having the drinks tube. The Garmin mount wasn't secure and slipped around, so I glued some inner tube onto the bar to prevent the mount slipping around. There used to be 50ml in the Elite Crono aero bottle on the frame. I'd frequently leave this empty but in place because it weighed mere grams and in my ignorance, I assumed it part-filled a 'hole' in the frame shape so it more aero. However, I have decided to (perhaps) re-deploy it for UK races where there's a chance of rain. By cutting a hole in the top of a spare bottle, I can store an inner tube, inflator head, gas cartridge, tyre levers and a Sportful HotPocket rain jacket. 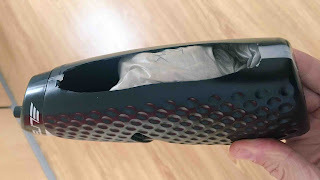 Yeah, it looks a mess in those pictures, but I could easily put gaffa tape over this and only expose the hole if I needed access. I have no idea whether this will work. 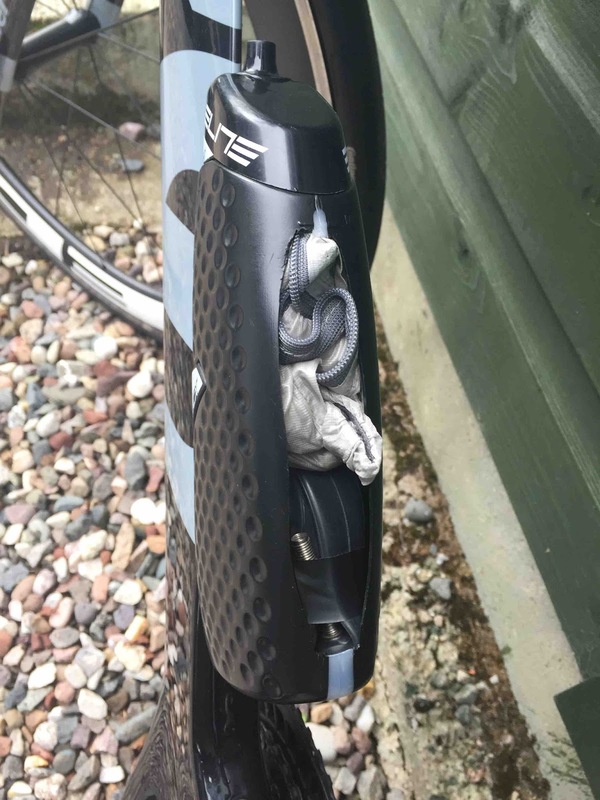 I showed a photo to my coach and he suspects it will be aero-messy once the tape fails to round-off the top. Since he knows way, way more about aerodynamics than I do, he's probably correct. Will tape make this aero or no? Still, I rather like having this as optional storage, especially if it means getting rid of that Vittoria tool carrier behind my seat. In fact, that whole behind-the-seat mount could be empty. Ironman bike aid stations operate 'bottle-exchange', they give you a fresh bottle filled with either water or energy drink. So I could start with just the front tank and keep topping it up at aid stations along the way. 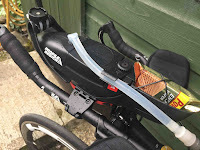 If I fail to ditch the new bottle before the end of the aid station (the only place you can jettison a used bottle) then I'll just stick it in the rear carrier until the next one. This is starting to sound like a plan. I'll test it this week in training, and more importantly during Staffordshire IM70.3, which is really just a 'B' race for me this year. If you have tried and junked any of these ideas or you can contribute a better way to carry all the stuff, then seriously, I would love to hear from you. Add your thoughts in the comments below.